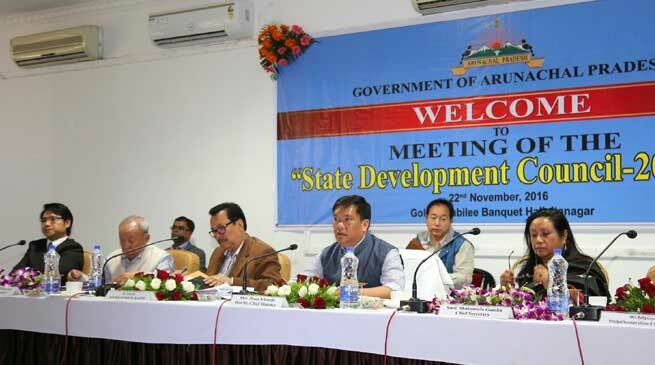 “It is our collective duty to restore the image of governance in our state”, stated by Chief minister Pema Khandu in the State Development Council ( SDC ) meeting held at Banquet Hall on Tuesday. The SDC meeting, a prerequisite procedure for developmental projects, its implementation and financial matters, was conducted today at Banquet Hall here under the chairmanship of Chief Minister Pema Khandu in presence of Deputy Chief Minister Chowna Mein, who also holds the portfolios of Planning and Finance. Addressing the meeting, the Chief Minister categorically conveyed that the Prime Minister has given him specific instructions on transparency and that he is duty bound to adhere to the orders. Therefore, I humbly submit to each one of you to exercise caution and restraint and ensure judicious use of public money by following all codal formalities. The government is duty bound to ensure this and needless to say, we shall deal with any violation with exemplary action,” he said. Regretting that this year due to several unavoidable circumstances the SDC could not be held in time, the Chief Minister, however, emphasized that the single mandate for the Government is to meet the aspirations of the common citizens by bringing in transparency in governance, and providing basic infrastructure, especially in remote rural areas. It was a collective decision of the Government to hold the SDC meeting by all means. Khandu informed that the Union Government has made certain structural changes in the budgeting exercise to be followed from the fiscal year 2017-18. The key changes are i) The Railway Budget has been subsumed within the General Budget and therefore no separate Railway Budget will be presented in the ensuing Budget session, ii) The Plan-Non Plan distinction has been dispensed with and now budget will be classified only in revenue and capital heads; and iii) The Union Budget session has been pre-poned and likely to be presented in the first week of February, instead of the traditional last week of February. Pointing that the cascading impacts on the states are therefore to be anticipated and necessary preparatory works initiated, he said the State Government is therefore planning to hold the budget Session for 2017-18 in the last week of February 2017, just after celebration of the State hood Day. Khandu proposed to make certain important structural changes which would align the government’s development agenda with that of the Union Government. These, in a nutshell, would be participatory budget preparation by engaging all stakeholders to give suggestions in budget formulation for FY 2017-18, a detailed pre-budget exercise from 1st week of December 2016 by the Finance Department for holding wide consultations with all stakeholders including all concerned departments and by January end, the Finance Department will submit the draft budget to be placed before the Assembly. After passage of the state budget in the Assembly, the departments shall initiate procedures for implementation of the budget allocated to them. Khandu said the developmental activities which have so far been taken up in SDC meeting will form part of the budget document to allow departments sufficient lead time to plan and execute works and leave no room for uncertainty and delay. Further, the State Development Council will be responsible for holding quarterly meetings to review, monitor the implementation and the financial performance of each department would be closely monitored in order to maintain tight fiscal discipline. In the present financial year, as the departments have only 3-4 months for implementation of the schemes and projects, the Chief Minister advised all to project their respective requirements which can only be completed in this fiscal after following all codal formalities. He made it clear that projects taken up with the normal state funds shall stand lapsed, if not completed by 31st March 2017. Payments will be made on physical progress and adherance to codal formalities. “These schemes shall not be carried forward in Part V and shall be reflected in the next budget as ongoing scheme. However, CSS projects shall continue in the old system,” Khandu informed. The SDC meeting was attended by the Speaker, Deputy Speaker, Cabinet Ministers, Parliamentary Secretaries, the Chief Secretary, Principal Secretary, Commissioners, Secretaries and other senior functionaries of the state government.